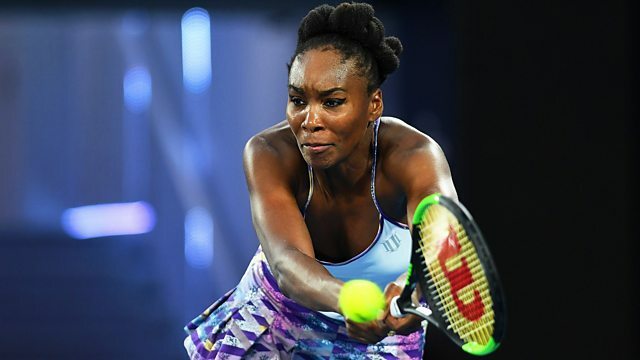 The best of the action from the Australian Open women's singles final at Melbourne Park, where Venus Williams faces Serena Williams. Commentary by Jonathan Overend and John Lloyd. Browse content similar to Women's Final Highlights. Check below for episodes and series from the same categories and more! sisters but this has become one of tennis 's great rivalries. are looking forward to in Melbourne this weekend. We can join the final. final. Hello! It's a bit early for that! early in a match. Very unusual. Talk about tension. times they play, they know each other's games so easily. this final. -- racket. One racket down but Serena won game in front. surface is very fast this year at the Australian Open. confident that she will go for the big serve. Serena is feeling the tension out there. finally getting her first service hold on the board. did well there. Drop volley. Oh! LAUGHTER. That's the real Serena! That really was outstanding tennis, those last two points. didn't work. Well, it's hotting up now, isn't it? final. A little bit of daylight on the scoreboard. is something extraordinary. They played here in 1998, 19 years ago. of aces when it mattered, she holds to love and takes the opening set. We pick it up in the second, it is one game all. There's that pressure, Serena Williams moving inside the baseline. second serve return suggests Venus needs more first deliveries, here. rally with that serve, at least she has a chance to get into the point. tactically, that little switch up does need to be made. Absolutely. most of her opponents, weren't even born when she made her debut! such a good point there. It's that easy shot at the end. Went back to going for the big first serve on that point. Went for the bigger second serve as well! She has no choice. was Wimbledon 2008. Last played a final in Wimbledon 2009.
one. There is the prize. These two ladies contested the trophy in 2003.
power and accuracy, she takes over the rally. Such a good athlete. returns in that game. A break ahead, 4-3, two games away from the title. forehand, and then she can flatten it out when she wants to, as well. Whitwell, that flew by in less than a minute. -- four first serves. Well, that flew back in less than a minute. Venus Williams serving to stay in the match at 3-5.
game to stay in the championship. For now. times a winner in the past, is serving for the match. get this title easily. Best rally in the match. This is really heavy hitting now from both these fierce competitors. but the nerves will still be in fading. It is championship point. competition. The trophy will be presented by Hannah Manlicova..
say thank you so much. She deserves an incredible round of applause. guys, Patrick you are the best. Life wouldn't be possible without them. there competing. You look at them on court and they don't look their age. to be back to their best. Is staggering and another great story. Serena. COMMENTATOR: She moves on to 23 Grand Slam singles titles.